We've come a long way since the first building regulations were introduced in 1667. The London Building Act led to more comprehensive regulations being introduced in 1774, and by the 18th century, most British cities were governed by some form of building control. In 1978, Bristish Standard BS 5534: Code of Practice for Slating and Tiling, was first introduced. 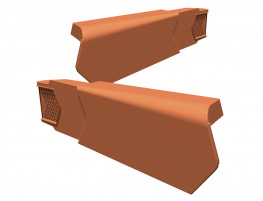 Until now, the most far-reaching change was in 2014 when reforms were made to the wat pitched roofs were fixed in the UK, effectively banning the use of mortar without the use of additional mechanical fixings. The standard recognised the need for a change in the reliance of mortar alone to fix roofing elements in place, which is identified as the single largest cause of roof failures. Another fundamental shift came with the introduction of a new British Standard in February 2018, in response to the rise of dry fix systems over the use of traditional mortar bedding. With such high levels of competition, there was concern that not all products would perform t the same level and result in product failures. 'BS 8612: Dry-fixed Ridge, Hip and Verge Systems for Slating and Tiling - Specification', aims to address this by providing specific guidance ona range of performance criteria and methods of testing. Even prior to the introduction of BS 8612, there is still the mistaken belief within the market that all dry fix systems "are very similar". Nothing could be further from the truth; not all products achieve the same standard. 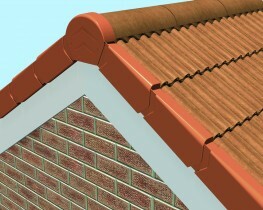 By providing housebuilders, contractors, building control offiers and local authorities with minimum performance requirements, calculation methods, test regimes and guidance on how to interpret the data will ultimately inform their purchasing decisions and ensure that the products fulfil the requirements of the building in which they are installed. The new standard contains two key types of testing; those with a simple pass or fail criteria, and those that provide a performance value for the product which can be measured against customer requirements. For example, the Manthorpe dry-fix products passed all of the pass/fail tests, and attained an excellent result on the other perfoemance-based tests. Within the overarching types of testing, there are seven intrinsic elements that are carried out to determine the performance of dry-fix products against the requirements of BS 8612. They are: tensile strength, peel adhesion, ridge-roll elongation, rain drainage, wind uplift resistance, horizontal wind-resistance, and durability (UV ageing). Of the seven, only four require a clear-cut pass or fail. Performance-based test results give a design-resistance for the product tested. This should be compared to the calculated design load on the product in particualr detail. Calculated loads take into account a number of factors when assessing product suitability. The load calculations consider the exposed area of the roof, projected wind speeds for the location, height of the property and other positioning and safety factors. Wind uplift calculations use a zonal map to calculate the wind loads for various areas of the UK. The exposure rating of the building increases the risk of wind uplift so, buildings further north, or in coastal or elevated areas are more at risk. These formulas can be used to calculate a minimum resistance force that the ridge or verge element must withstand for the size and location of the building. Building designers can then use these design resistance values to understand if a product will be suitable for use on their buildings. Choosing a poor quality system could end up being more costly than making the higher quality choice from the start, so having independent verification of ongoing compliance to the latest industry standard for these types of products provides reassurance.